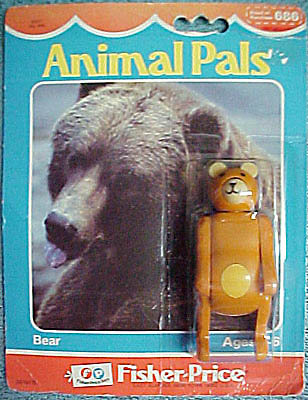 Description: The Animal Pals Bear set includes one Original Little People bear sold on a blister card. The bear is orangish-brown with a tan snout, tan ears, and a tan tummy patch. WB - Orangish-brown bear with a tan snout, tan ears, and a tan tummy patch. This bear was sold in #699 Animal Pals Assortment. This was sold in a 5-3/4" long, 7-1/2" high, 1-1/2" deep peggable blister card that had a picture of the real bear on the package.